There was a huge truck’s explosion due to Bomb blast in Somalia which killed at least twenty (20) people in the capital city of Mogadishu. The residents where the catastrophic incident happened were shaken due to the powerful bomb blast they had heard in years. 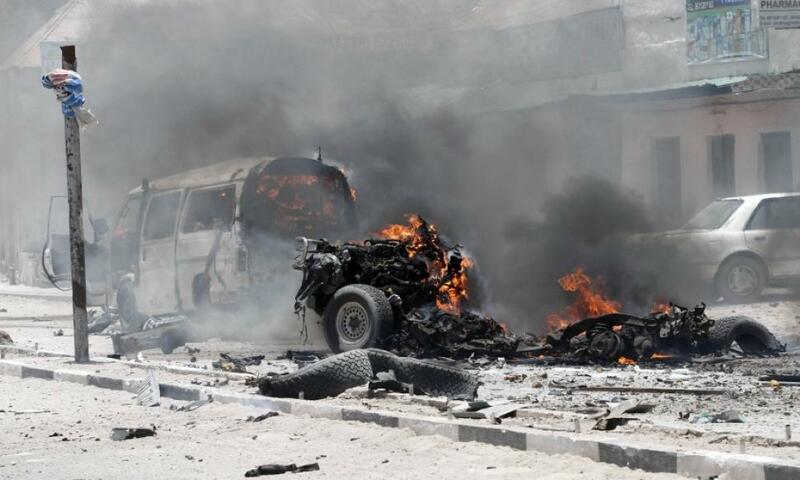 While there was no quick claim of responsibility for Saturday’s blast, al-Shabab often targets high-profile areas of Mogadishu with scary bombings. The explosion from the truck was initially appeared to have been targeted at an hotel on a busy road in Hodan district and the death toll could rise, a police Capt. known as Mohamed Hussein said. The blast from the truck in Somalia happened after two days when the head of the US Africa Command was in Mogadishu to meet with the president of Somalia and also, two days after the country’s defence minister and army chief resigned. The Somalia’s truck explosion happened in the city’s K5 Junction which is very closed with government offices, hotels, and restaurants. The bomb destroyed several buildings and set off dozens of vehicles on fire.